I have some fun news. Natalie and I have been working on a project for months now (gosh actually talking about it for over a year) and it's finally ready. We happily present to you: Feliz. Feliz will be a whole weekend full of activities. 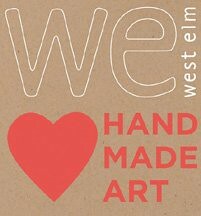 We're having a meet and greet party at our sponsor store, West Elm (and maybe another fun get together but that's hush hush for now), workshops on Saturday and a holiday sale on Sunday. We're already working with about a dozen artists but we're taking applications for more! If you've followed this blog you know I've done some events in the past. Those events usually featured artists that were chosen before announcing the event itself. This time around we wanted to open it up to others to try and find some new great talent (or maybe some old great talent we just didn't think to ask;). We are so excited to share the details with you over the next few months. We are thrilled to be hosting this here in Austin. This whole planning process has been such a great way for me to get to know this city better and I can't wait to share more about that. A huge thanks to Natalie for bearing with my new Mom brain and for being a super inspirational partner. Thank you for reading, following and commenting. It may sound a little cheesy but you all have helped me through this transition into motherhood and a new life more than you'll ever know. Thanks for taking the time to check out Feliz!